I missed last week's post for Valentine's Day! Although it would have been nice to post a romantic dessert recipe for two, Adam and I gave up dessert for Lent. I also could have also posted a romantic dinner for two recipe, but I wasn't up for that either. Last weekend I was in the midst of a stressful few weeks waiting to hear back from job interviews, so on Sunday night, Adam made pasta for me (our Valentine's tradition) and we snuggled up on the couch to watch a movie. It was lazy and perfect. I've made it a goal of mine in 2016 to take better care of myself--to say "no" when it's what's best for me, even if that means disappointing someone (so hard for me as a people-pleaser); to set better boundaries with people, including people I love, in order protect my emotional well-being; to give myself rest (and therefore not feel guilty about sleeping in an extra hour even if that means I miss a morning work-out or study time); to speak to myself as I would a dear friend instead of being so hard on myself. It's a gradual process, but I'm feeling the benefits already. Last Sunday, taking care of myself meant pasta on the couch with my person instead of school work or blogging, and I don't regret it one bit. Take good care of yourself this week. Maybe we should start with pizza? I've been wanting to make shakshuka ever since my cousin Aimee told me about it over the summer. It starts with onions and peppers simmering in a large pot. To that you add garlic, cumin, and a bunch of paprika. Next whole or diced tomatoes go in, and the mixture simmers until reduced. Make several wells in the sauce and crack in eggs. Cover the pan and cook until the egg whites are firm, and then top with crumbled feta and chopped parsley. 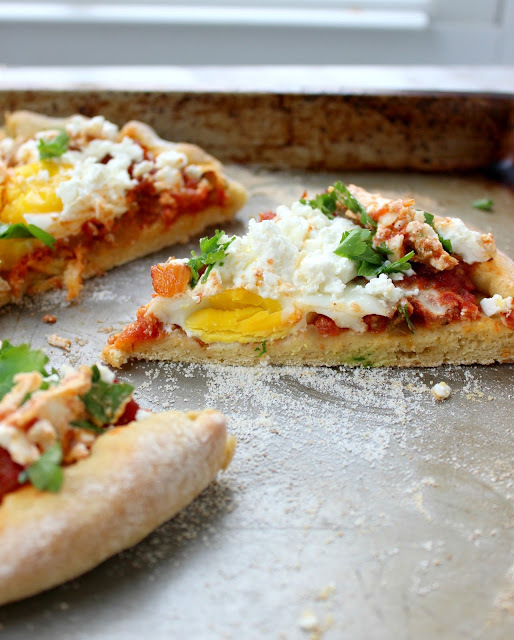 Use crusty bread to sop up all the delicious spicy tomato sauce, eggs, and cheese--> clearly my kind of dish. 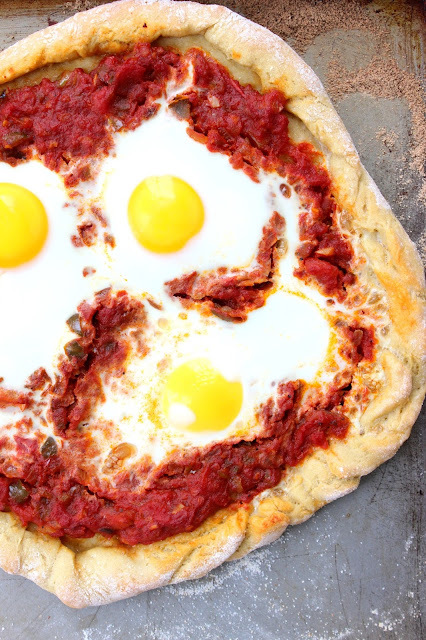 This shakshuka pizza takes all the goodness of the tomato and eggs and puts it directly onto the bread--or in the case, pizza dough! 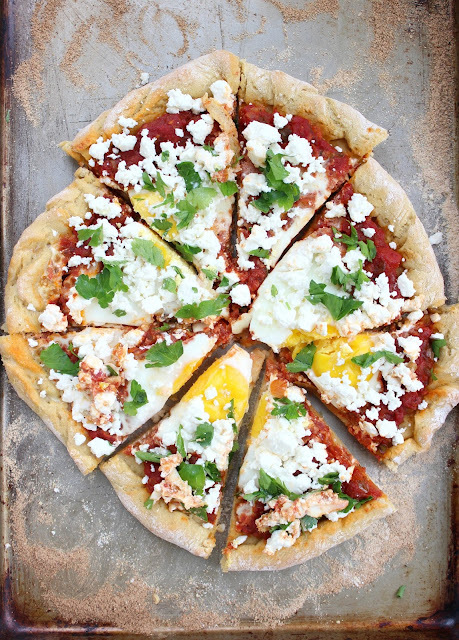 This pizza is also a nutrient power house thanks to some special ingredients-->organic Einkorn all-purpose flour and organic diced tomatoes. Jovial Einkorn flour is made from an ancient grain of wheat with more vitamins and minerals than traditional processed wheat, including 40% more protein and 15% less starch. Jovial tomatoes are grown in Italy and packaged without salt, sugar or other additives. They sent me these products for free, but I've been so impressed with the quality that I'll be buying more myself. Their products can be found at Whole Foods, Earth Fare, Fresh Market, and other local grocery stores. Taking care of ourselves includes eating good food that happens to be good for us too! Add olive oil to a pan over medium high heat. Add onion and green pepper and cook for 5-6 minutes, stirring occasionally. Add garlic, cumin, paprika and red pepper flakes. Cook for another 2 minutes, or until garlic is starting to soften. Add the diced tomatoes and water. Cook for 15 minutes, or until liquid is reduced. Taste and add salt and pepper as necessary. Sprinkle corn meal on a cookie sheet. Roll out pizza dough to desired shape and place on cookie sheet. 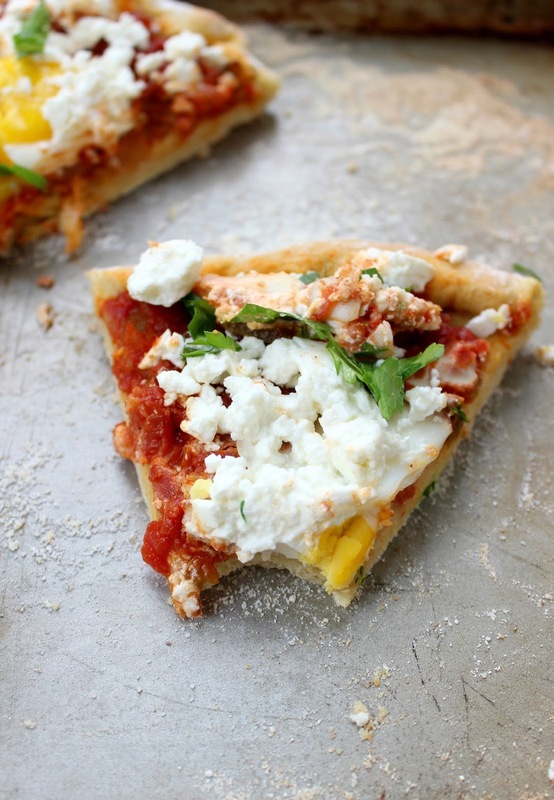 Add sauce to pizza dough and spread in an even layer. Then use a spoon to make three wells in the sauce. Crack an egg into each well. Carefully place pizza in the oven. For runny yolks, bake for 10-12 minutes. For firm yolks, bake for 13-15 minutes. 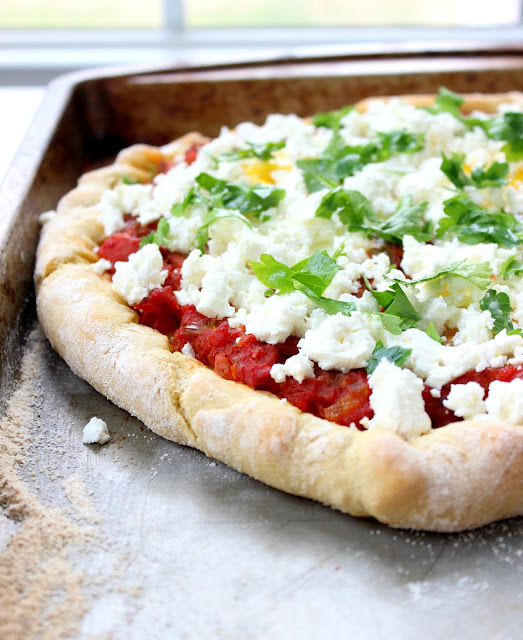 Remove from oven and sprinkle with feta, followed by parsley. Depending on how thinly you roll out your pizza dough, you may have leftover sauce. You could make a second pizza, or reserve the sauce to eat later! Shakshuka adapted from Smitten Kitchen. This sounds like a great goal for 2016, Trisha, and it got me thinking about my blog/personal life balance too. 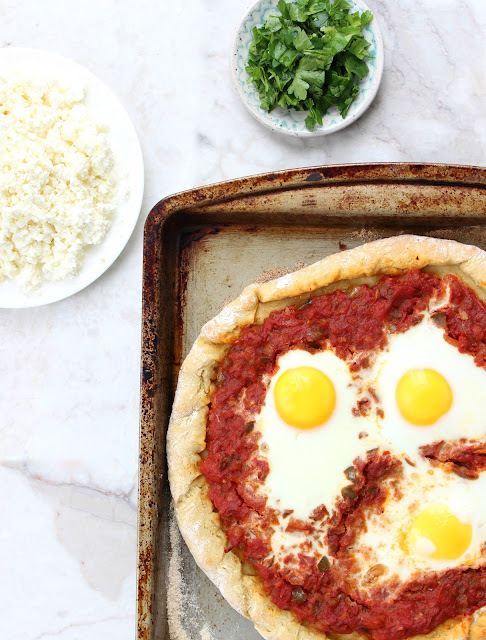 I was so surprised to see Shakshuka on a pizza, that's a great idea! One this pizza sounds fantastic. It's been far too long since we've had a pizza night at our house! And two, I'm trying to be better at saying no this year too ... I tend to just say yes all the time since I am also a people pleaser but I'm learning that I really need down time, etc. for my own mental health!! Taking better care of oneself is always for the best - but I know how hard it can be to say "no" to people, that's such a great goal, and I definitely need to do a better job of that myself. This pizza looks delish, I actually happen to have some shakshuka sauce in my pantry that I've been meaning to use - pizza night it is!